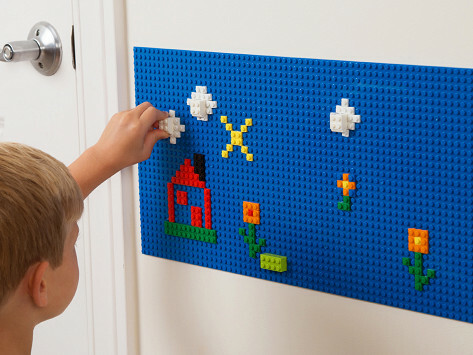 Transform any flat surface into a toy brick canvas. These building brick tiles are removable and reusable, letting kids create fun designs on walls, doors, or furniture without any worry, or damage. You can also combine them with any building bricks you might have at home (think: LEGOS, KREO, Mega Blocks). This full set includes everything you need to get started building your wall tile masterpiece. 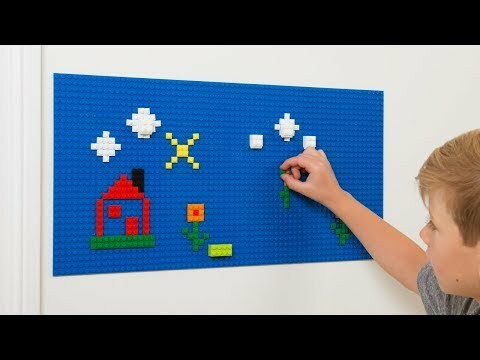 Dimensions: 10.5" x 10.5" x 2.5"
Brik Tiles let kids get artistic on virtually any flat surface. The tiles turn a wall, table, door, or almost anything smooth into a pegged canvas they can decorate with their own colorful brick masterpiece. The tiles are removable and reusable. So you can stick them on walls, furniture—even the fridge door—without any worry or damage. The set comes with its own building bricks, but they’re also compatible with ones you might have at home, like LEGO, KREO, and Mega Bloks. When they aren’t entertaining kids, Brik Tiles can be used to configure more functional contraptions (e.g., brick clips let you hang drawings or pictures from the tile). By moving play areas off the ground, parents will appreciate the clear (toy-less) floor space. We think they might even enjoy creating brick installments of their own, too.